The main reason I became attracted to Georgian culture was because of the music and dance that leaks out whenever step into their world. Yes I have visited Georgia to explore puppetry. That was my justification at least for going as part of my nearly finished Gravity From Above documentary film project exploring the meaning of puppets through Europe. And I found so much great puppetry there. Truthfully though, it was the music and dance that called to me from half a world away. I have already introduced this subject in another essay. But as I am writing this Georgian Lessons series there is no deeper lesson that I could pass on than that found in Georgian music and dance. (I would recommend going back to my introductory words first, though it isn’t necessary.) My perspective on Georgian music and dance has deepened considerably since that earlier essay in 2012. And I hear much more in the music now than I did then. It has to start with voices. If you have a trio of polyphonic Georgian voices you pretty much have everything. Add to that the handclaps and you have the rhythmic structures that underline the dancing. All of the other developments arise from those basic elements. 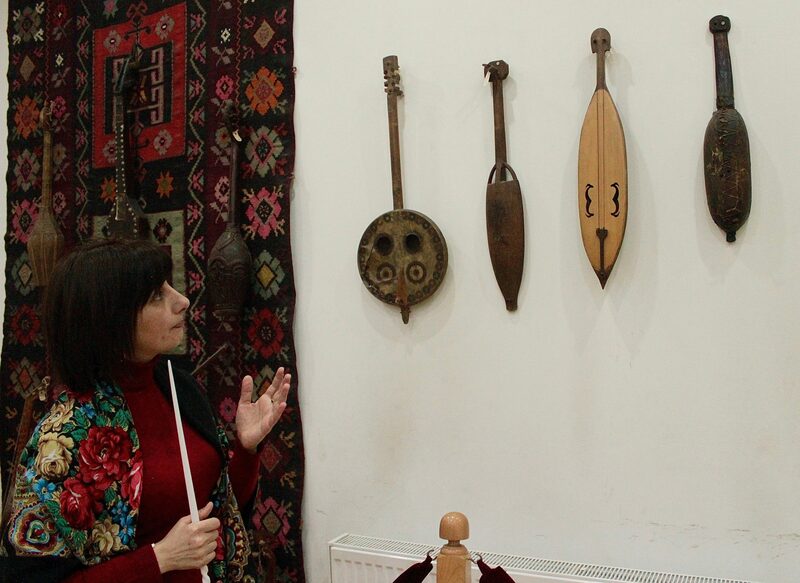 Singers at Erisioni practicing a traditional song. To look a little more closely, the voices almost always have a central voice, a bass, and high voicing. The central voice will often contain the melody, the other voices can provide a simple harmony, but more often it will immediately get much more complicated than that. The bass, particularly in Eastern Georgia, will usually be a drone. Sometimes the drone will shift pitches to offset the melody. The high voicings may spiral into orbit or in the case Gurian music will shift into a rhythmic yodel. The melodies themselves will often be bittersweet, sounding somewhere between the minor keys of Eastern Europe and the astringent modalities of the Middle East. But where the Arabic Middle East is positively allergic to harmonies, Georgia revels in them. Not only harmonies, but multiple melodies. And the harmonic structures will then do something unique in the world. They will dip into extreme dissonances as well. Not in a Modernist sense. This isn’t Schoenberg’s 12 tone row. Somehow, and here is the mystery, they resolve the most abstract of dissonances easily and often back into the bass drones. Stepping into a Georgian Orthodox Church one evening I was overwhelmed by the intense beauty of the antiphonal polyphony. Somehow the tension between dissonance and harmony conveyed ineffable symbolic resonances of the unutterable sufferings and inexplicable meanings of life. And it made me realize how impoverished the vast majority of contemporary Western Christian church music has become in America. But then again this deep music was not congregational singing. It takes trained voices to sing in such a way as to convey the holiness of God in the Georgian Orthodox Church. When in Georgian folk traditions, not the church music, you add the handclaps you suddenly have something deeply expressive of real joy. In many of the local Georgian regions Svaneti or Guria, for instance, the voices are already setting a beat. The clapping adds layers of motoric syncopation that practically propel the body into the dance. If this sounds a bit like African music there are aspects of Georgian dance music that indeed strike me as closer to African than most other standard forms of European traditional dance music. Not that it comes from any actual African influence. Georgian music in turn can also sound Greek, Middle Eastern, Persian, Armenian, Russian, even like Western Europe. And these areas have all had some influence upon the basic Georgian polyphony, which is stretches back into antiquity. 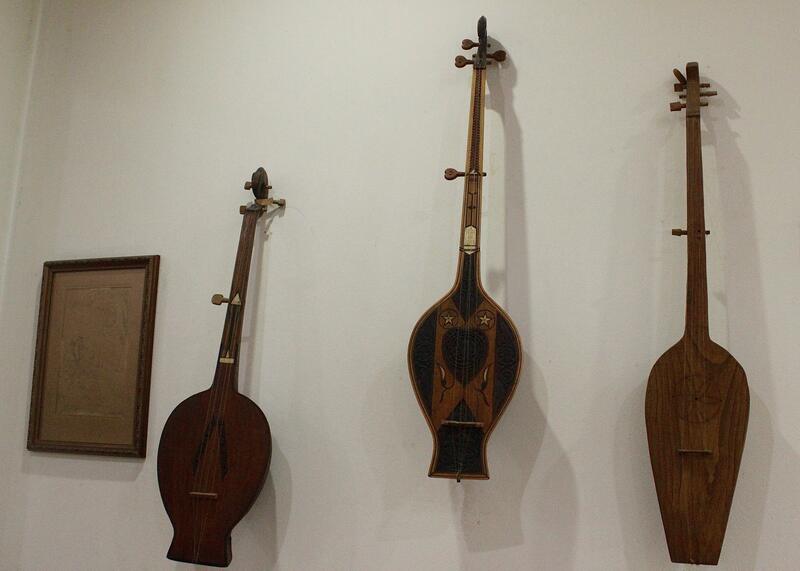 Add to the voices and basic rhythms the more traditional instruments, the panduri and chonguri, which are both in the guitar family; the doli, which is a handheld drum; the duduk a reedy droning flute, originally from Armenia; the garmoni, the Georgian accordion which has a unique tuning, and several others. And you start to have a powerful arsenal of musical tools to create an endless variety of sounds. 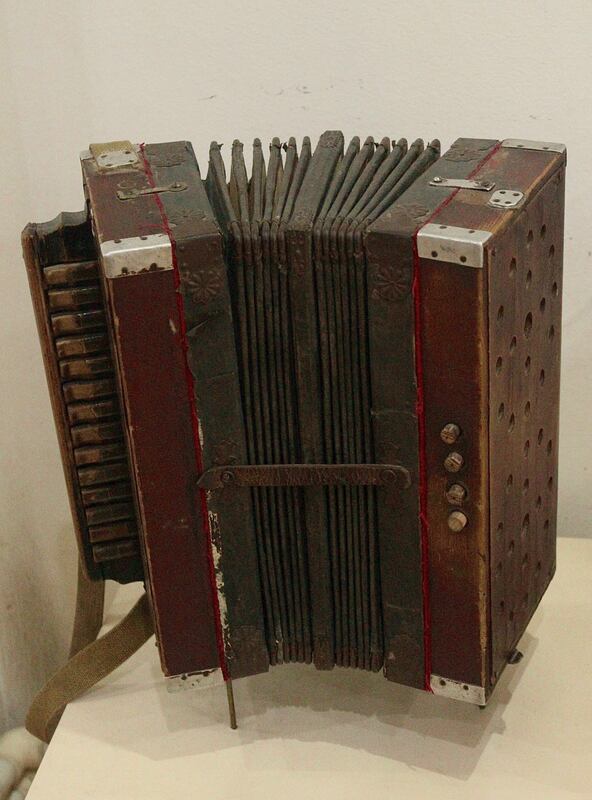 Over time pianos, organs, guitars, electric instruments and electronic instruments have all been added to the stew. And curiously Georgia is now seen as one of the European centers of electronica. In talking with DJ Giorgi Kancheli he demonstrated the same respect for music that I encountered from so many other Georgians. He didn’t see his music as any sort of rejection of his musical culture. And this was one of the aspects of Georgian culture that struck me forcefully. 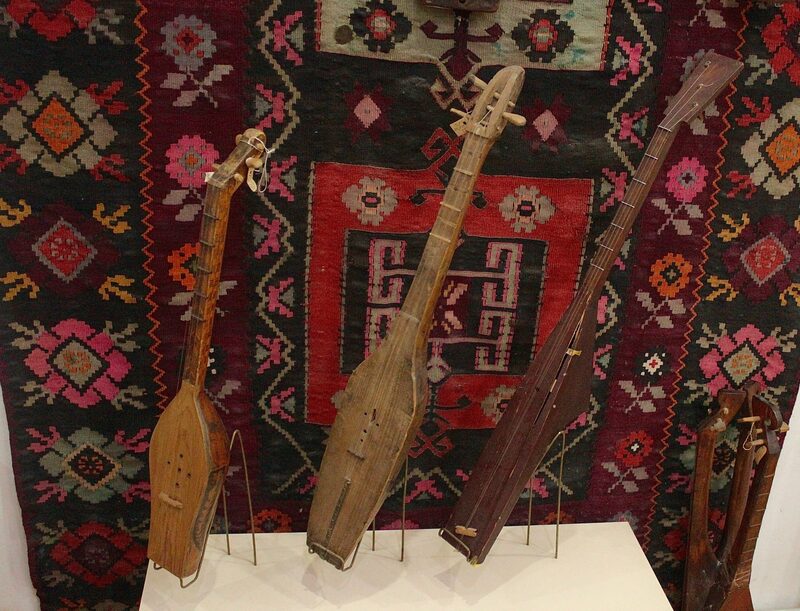 I was impressed not only by the Georgian music I was hearing, but also by the musical curiosity and knowledge that many Georgians displayed. One friend, a surgeon studying to be a neuroscientist, asked me if I knew the music of American composer Moondog. I was completely impressed. I did know of the blind street performer Moondog who used to dress like a viking of the sidewalks of New York City who made several recordings of his naïve symphonic music. Now how many Americans per 10,000 people would know of his work? A handful? Maybe. Maybe not. Have you ever heard of Moondog? And yet here was this young Georgian woman who was conversant with his oeuvre. Have you ever heard of Moondog? And I often found that Georgians knew these strange details from musical history. I pondered why. Why did this culture seem to have such a connection to musics from various corners of the world? And here is what came to me. Georgian folk music traditions are so complex that it makes it easy to absorb music from most other cultures with real appreciation. If there is some truth that the exposure to basic classical music is good for a child’s development then the Georgians are ahead of that game, since their folk music tends to skip Mozart and go straight to Stravinsky. And that does raise the following specter. How shall future Americans learn to appreciate music beyond their own time and place given the diet of hollow commercial pop music that has been increasingly foisted upon us? Now I don’t want Georgia to seem like some musical paradise. Stepping into the new mall on Rustaveli Avenue one hears that exact same hideous, predominantly American, shiny overproduced pop music playing to the masses globally. And people are simply absorbing it unquestioningly. This will have an effect. Likewise the success of the EDM rave and club culture is going to have an effect upon the musical traditions as well. What kind of effect? I can’t say. And since they are largely influenced by German electronica, a culture that mostly disdains its own Germanic heritage, which is understandable considering its 20th Century history, there are already serious tensions in this zone. But Georgia, despite the presence of some ultra nationalists who hate the club culture, is not Germany. If you wander through the United States, choose a high school or university at random, and ask a collection of students to sing you a folk or traditional song very few if any will be able to do it. (I was recently informed how poorly even university level music students are with such things.) If you go to Georgia today, even with the omnipresence of the big commercial culture descending like an all consuming vulture, even in the presence of more postmodern forms of musical exploration, most Georgian youth would immediately be able to sing you a folk song. The good news is that the vultures only consume a dead carcass. And Georgia as Georgia is not dead. This entry was posted on May 15, 2018 by The Anadromist. It was filed under თბილისი, მარიამ ელეიშვილი, საქართველო, Chveneburebi, EDM, Electronica, Erisioni, Georgia - Country, Georgia Travel, Georgian Dances, Georgian Legend, Georgian Music, Georgian Orthodox Church, Giorgi Ushikishvili, Mariam Elieshvili, Nazis, The Anadrome and was tagged with Christianity, Dance, Europe, Georgia - Country, Georgian Music, Georgian Puppets, Germany, Giorgi Ushikishvili, Music, Tbilisi, technology, Travel.